Elizabeth Rooney, who died in March 2016, was an important figure in the revival of printmaking in Sydney in the post-war period. Born in Sydney in 1929, she studied painting and drawing at East Sydney Technical College in the late 1940s. 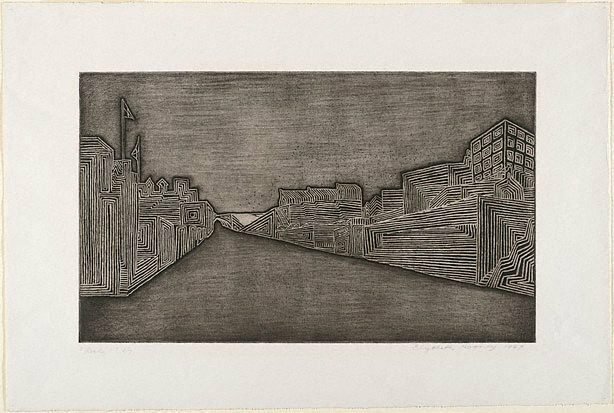 In 1949, the last year of her studies, Rooney began making etchings under the influence of one of her teachers, Herbert Gallop, and soon discovered that prints were her metier. Unable to travel or study abroad, and with printmaking in a moribund state in Sydney, she was forced to teach herself how to make prints using the books of British printmaker SW Hayter (1901-88). Through discussions with other artists - her first etching press was given to her in 1954 by Bim Hilder - and experimentation with techniques and materials, she was to produce a distinctive oeuvre of over 400 etchings spanning more than five decades. 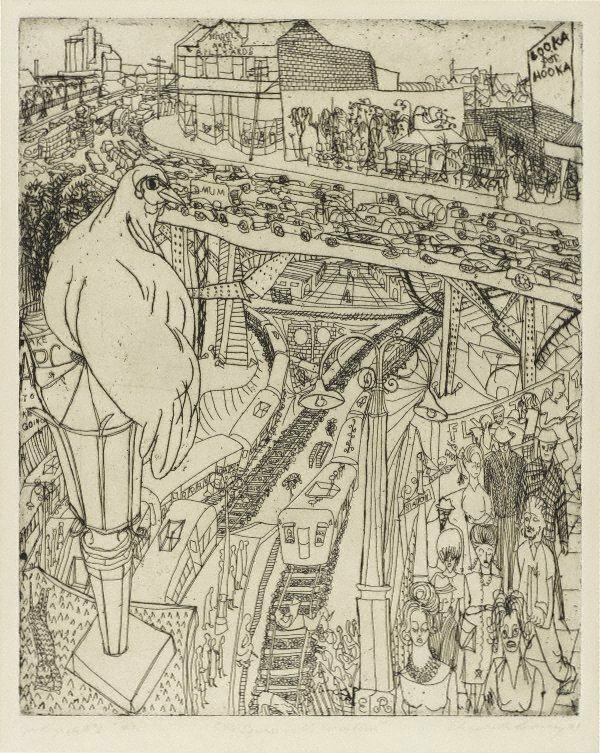 Rooney’s prints were often bitingly satirical – she was interested in urban conservation and development, referring to the changing faces of Sydney and Newcastle in her work. An early phase of abstraction in the 1960s was something of an aberration, with the majority of her works executed with her trademark linear figuration. 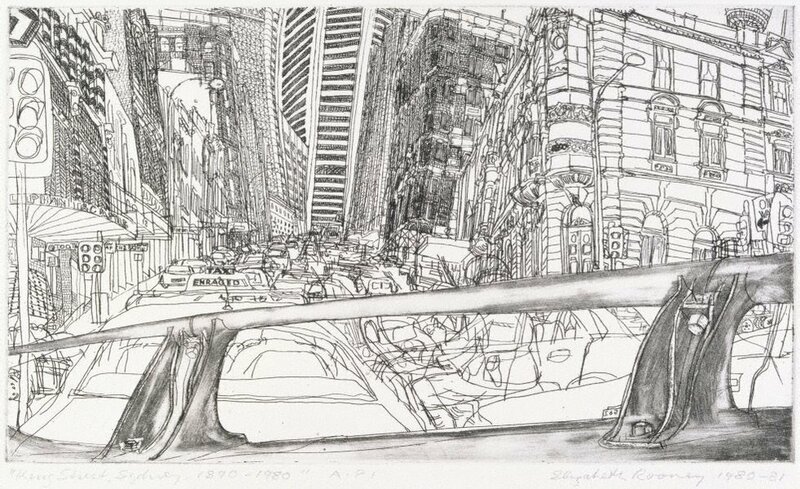 A key figure in the contemporary printmaking revival that occurred in Sydney in the early 1960s, she was a foundation member of the Sydney Printmakers group that included Henry Salkauskas, Earle Backen and Eva Kubbos, and a regular exhibitor with the Contemporary Art Society. Her work was included in the important First Australia-wide graphic art exhibition. In 1961 she was co-founder with Joy Ewart, of the Workshop Arts Centre, Willoughby, a well-loved community art workshop still in operation today. 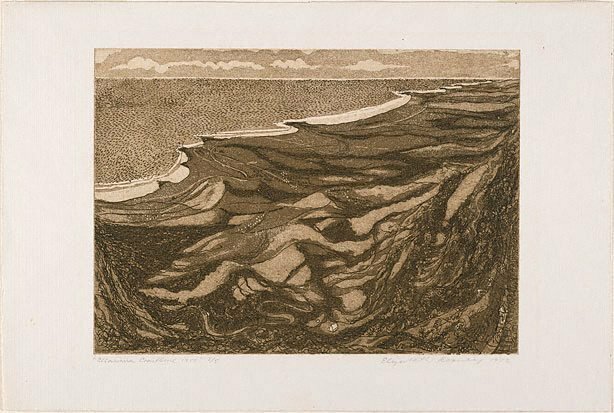 Rooney’s prints are held in a number of major collections, including the National Gallery of Australia and the British Museum as well as the Art Gallery of NSW. This print is from a series of three based on the architecture of the Rocks area, near Circular Quay, Sydney. It reflects contemporary trends in painting at the time, with hard-edged, geometric forms and a solid palette of colour dominating the image. The plate is deeply etched; it was also printed without ink as an embossed image. The Goodbye to all this series is a play on the title of Robert Graves’ book Goodbye to all that. The series, which included seven prints in all, was a farewell to the artist’s childhood home in Strathfield. It shows a busy overpass, with the train Rooney had taken every day to her studies at the National Art School in Darlinghurst running perpendicular to it. The scene is congested and busy, but the white bird that dominates the image injects an air of quietude and peace, expressing the artist’s mixed feelings about leaving home. This print was exhibited at the Sydney Printmakers annual exhibition in 1963 and in the important Australian prints today exhibition at the Smithsonian Institution, Washington in 1966. 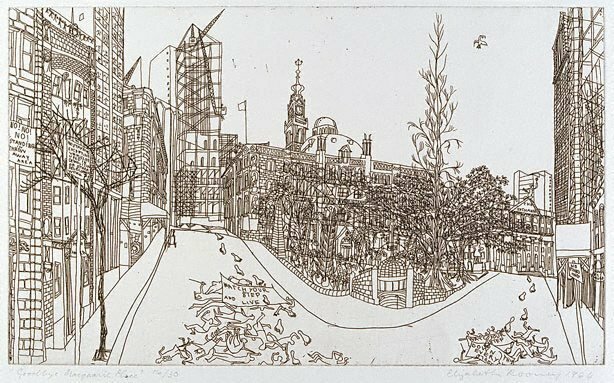 Rooney made a number of ‘comparison prints’, as she called them, using re-worked etching plates, to show the changing face of the city. 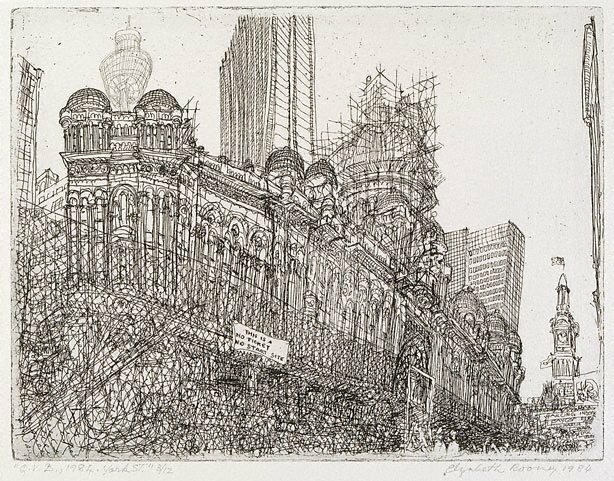 Goodbye Macquarie Place and Macquarie Place revisited were printed from the same plate, first etched in 1964 and then extensively reworked (that is, into a second state) nearly 20 years later. Her aim was to show the impact of development on the environment, and its impact on its inhabitants. Macquarie Place is in central Sydney and was first formalised as open public space by Governor Macquarie in 1818. Surrounded by magnificent 19th-century sandstone buildings, it changed considerably in the 20th century with the encroachment of roads and modern buildings. Rooney’s later visit in the 1980s shows some improvement, however, in the growth of trees planted the previous decade, and her removal of the metaphorical scattered bodies that littered the scene in the earlier impression. 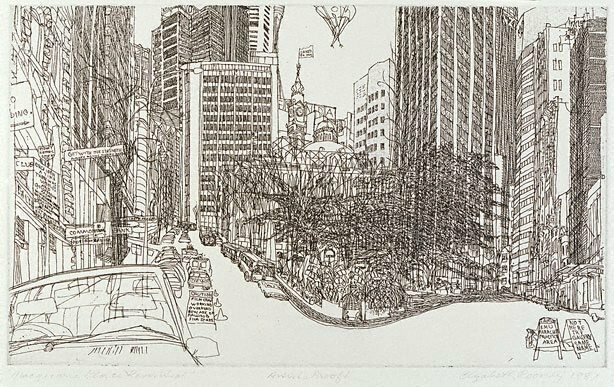 This print casts a critical eye over the redevelopment of Pyrmont and Darling Harbour in the 1980s, which radically changed the 19th-century streetscapes with new developments. 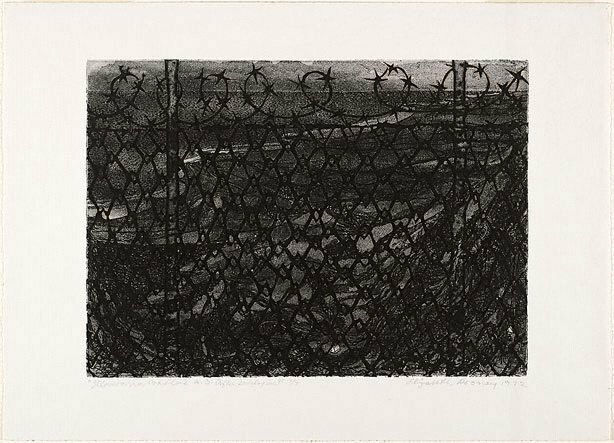 The wire fencing (a common feature in many of Rooney’s city prints), cranes, building machinery and text-laden airships (referring to 1980s entrepreneurs and developers) are ugly intrusions into the landscape that speak of pollution, destruction and the inexorable march of ‘progress’. Illawarra coastline 1950 and Illawarra coastline AD (after developers) are from the Clutha series. ‘Comparison prints’ made from the one re-worked plate, they were created in response to the news that the NSW Government was planning the development of the Illawarra escarpment, a beautiful landscape south of Sydney with views out to sea and down the coast, through the passing of the Clutha Development Act. Opponents to this plan held a protest exhibition, Our country, at the Arts Council Gallery in East Sydney, in which these prints were shown. The exhibition statement embodies the overriding theme in Rooney’s art – the urge to record the physical legacies of the past, under threat from the forces of development and ‘progress’, before they were lost forever. ‘The aim of this exhibition is to stimulate public concern for our natural assets in the area threatened by the Clutha Development Act. The theme...is not to dwell on the sordid side of environmental degradation but rather to extol what we now have and are well on the way to losing’.